Works with the following batteries: Diehard Platinum Group 31M, Odyssey Group 31M, NorthStar Group 31M, Trojan Group 31M, Optima Group 31M. Allows for installation of a larger group 31 battery. This cage mounts in the factory location with heavy duty J-Bolts. All hardware is included. These batteries provides massive gains over stock group 27 size batteries. With 1150 CCA and a 205 minute capacity, it out-performs any other in its class, as well as some dual battery setups, without the dual battery cost and installation. These batteries are sealed AGM batteries that are designed to take abuse and shock. 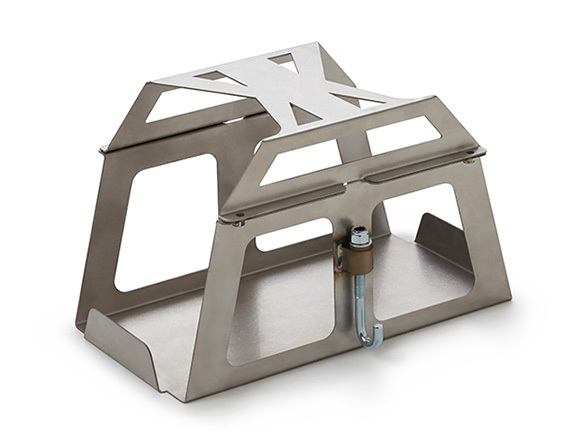 Dual posts allow for easier installation of your aftermarket leads. For people with a large amount of aftermarket accessories, lighting, stereos and winches, these batteries are a must. Battery Cage is made from Stainless Steel, so it will not corrode or rust. Painting or coating is not required. All hardware is included. Installation is just as simple as changing a battery. The factory j-hook locations are still used, however, we provide heavier duty replacement j-hooks with the cage. No drilling or modifications are required.